The bikes were packed. Skye was ready to go early and was wiping her bike down. As I wiped Cherise down I realized her oil cooler was leaking and her tail light had come loose! The leak wasn't bad, just messy from the rain the night before. The tail light had to come completely apart to be tightened back to the fender. So much for our early start! As we rode through Santa Fe I thought of Terri, that I met on Mato Paha during the Gathering of Nations, and wished there was time to stop and visit. On to Cline's Corners, which we had thought was a town, but was just a big truck stop. We were very happy we had not pushed on through the night hoping to get a room there! Encino was just a ghost town, and Vaughn looked like it was dying. 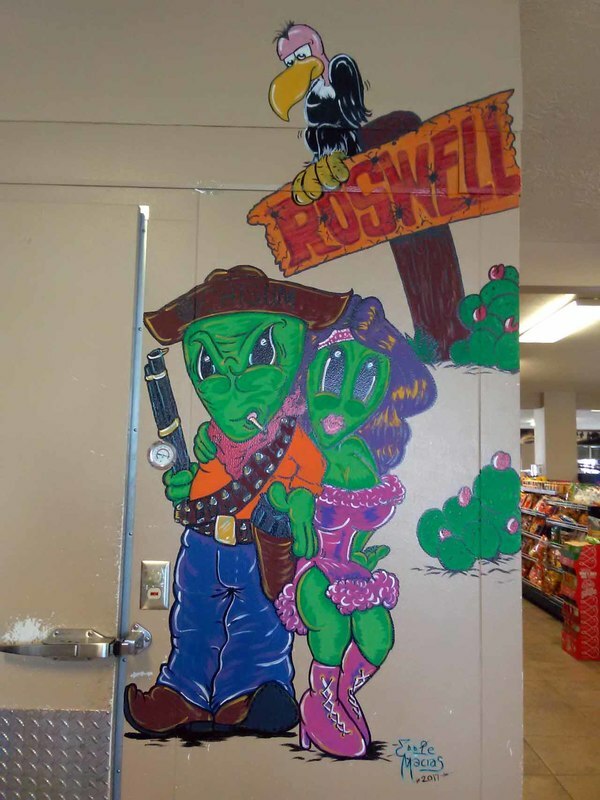 The 100 miles further to Roswell seemed endless and laughed that they even had patches of the aliens asking, "Are We There Yet?" Patti had warned us that the town was not as alien oriented as TV shows make it out to be. It was "anytown America", which was fine by us. It was just another stop on the route home. A quick stop again in Tatum and on to Brownfield. More boring, stinky (oil fields) roads. Our turn onto TX-137 was closed, but a kid at the gas pumps told us how to go around through town to pick it up again. We had been watching thunderheads form all day and by time we reached LaMesa the sky was dark and throwing lightening bolts back and forth. We pulled under cover at a Sonic to see if we could wait it out, eyeing the car wash bays next door. It looked as though it could spawn a twister. Checking the weather radar showed major storm activity covering US-87 from Silver City to Brady. Neither of us felt good about riding unknown roads through such a storm! Our hopes of attaining our 1K2Day patch were set aside in favour of a room at the Westerner and Chinese dinner from the restaurant next door.